The issue of Japan’s military sexual enslavement of South Korean women cannot be resolved through diplomatic negotiations, a government official said Thursday, amid worsening bilateral ties over Seoul’s decision to disband a Japanese-funded foundation to support the victims. “The issue of comfort women is not a matter that can be resolved in the short term through diplomatic consultations. Rather, it is a matter that should be resolved based on truth and principle,” said an official from the Foreign Ministry on condition of anonymity. “The government will sincerely make utmost efforts to restore the honor and dignity of the victims, and heal their wounds, by listening to them carefully,” the official said. The Ministry of Gender Equality and Family said Wednesday it would formally dissolve the Reconciliation and Healing Foundation created to financially support former “comfort women,” euphemism for the victims. The foundation is the key result of a 2015 bilateral agreement under which Seoul and Tokyo agreed to “finally” and “irreversibly” resolve the decades-old dispute over Japan’s sexual slavery of Korean women at its front-line brothels during World War II. Seoul’s Foreign Ministry said it will closely consult with victims first to draw a plan on how to spend the remaining funds, and consult the Japanese government based on the plan. Only some 4.4 billion won of the funds were spent for 34 survivors and the bereaved families of 58 deceased victims. The process of disbanding the foundation is expected to take six months to a year to complete. In the deal signed under the Park Geun-hye administration, Japan apologized to the victims and provided 1 billion yen ($8.9 million) to the foundation to support the victims in return for South Korea’s promise not to raise the issue again at international forums. The Moon Jae-in administration described the comfort women deal as “flawed,” but said it would not seek to renegotiate the controversial deal. However, it replaced Japanese funds for the victims with the South Korean government budget. 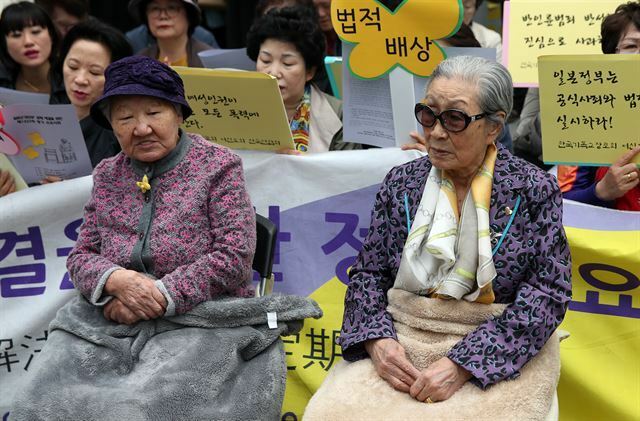 Former comfort women and their advocacy groups have called for the invalidation of the deal and the dissolution of the foundation, saying the “political” accord failed to address their suffering. Relations between South Korea and Japan are already strained after South Korea’s top court last month ordered a Japanese firm to compensate South Koreans for forced labor during Japan’s colonial rule of the Korean Peninsula between 1910 and 1945.